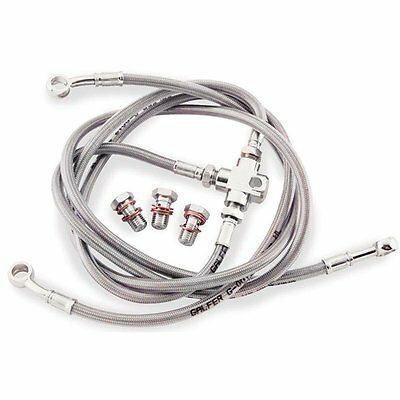 Galfer Steel Braided Lines Increasing your braking power and feel is as easy as upgrading to the Galfer stainless steel brake lines. These lines will greatly improve your braking effectiveness because there is almost no expansion under pressure, requiring less force to operate at their maximum. The brake lever feel stays firm (less squishy than rubber hoses) at all times. This advantage reduces braking distances and increases efficiency of the calipers. Galfer brake lines consist of three layers. The inner layer is a PTFE type 62 Teflon. The second layer consists of 16 strands of braided stainless steel. The outer layer is a plastic coating that protects the bike from scratches and keeps unwanted moisture out of the line. The kits come standard with polished silver on brass fittings with matching bolts. Galfer brake lines come with a lifetime warranty. Color fade, hazing, even crashing your bike will not void the warranty. Simply contact Galfer directly, supply some information, and get your new line! Listing photo is for refrence only. The actual 3 line configuration for each brake line kit is custom built for every motorcycle application and may not look like the photo. Galfer Steel Braided Lines - Increasing your braking power and feel is as easy as upgrading to the Galfer stainless steel brake lines. These lines will greatly improve your braking effectiveness because there is almost no expansion under pressure, requiring less force to operate at their maximum. The brake lever feel stays firm (less squishy than rubber hoses) at all times. This advantage reduces braking distances and increases efficiency of the calipers. Galfer brake lines come with a lifetime warranty. Color fade, hazing, even crashing your bike will not void the warranty. Simply contact Galfer directly, supply some information, and get your new line! All brake line kits will be shipped in Galfers Clear (Silver) line color pictured in the main listing photo. Black, White, Smoke, Blue, Red, Gold, Yellow, Green, and Orange line colors are also available upon request . If you would like your brake line kit in any of these other line colors please contact us before your purchase to check availability.